Rapper Remy Ma Responds To Nicki Minaj Ghostwriter rumors !! 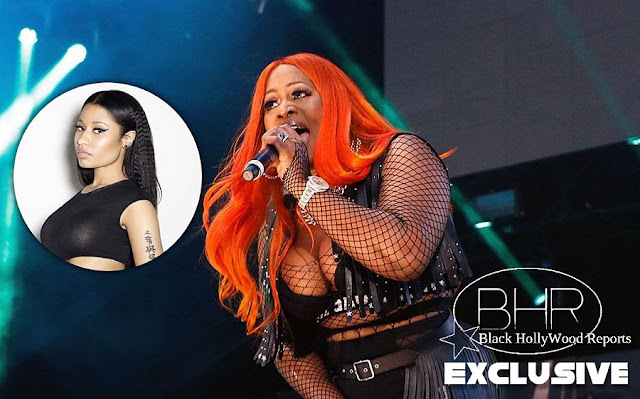 BHr Hollywood Reports.....In a video statement, the Bronx Rapper addressed her rivals(Nicki Minaj) most recent allegation, claiming that her husband Papoose Ghostwrote shETHER. "Get off my D**k. Yo I don't understand.... Like either y'all are trying to get my attention, or y'all think I give a F**ck. "Coming on my page thinking i give a F**K about the next hoe a** B**** is not gonna change anything. It's bit gonna bring the dead back to life. It's not." Remy went to address ghostwriting rumors too saying, "you know what's so crazy ? N****s say pap is writing for me." " First of a;;. my husband is dumb nice.... N****s ain't never want to give him props. Noe, when n****a get "shethered", now all of a sudden he's writing my rhymes. That's not all she had to say, watch the video below to see what all she had to say.